Posted in English, English for empowerment on May 26, 2018 by Nataasha Southwell. Written by Ruchi Jain, Academic Manager East India and Deepali Dharmaraj, Senior Academic Manager – Training Consultant Network and Resources. ‘I will talk to my Ma about giving me the same food as my bhai (brother)’, said Rani. ‘We will protest against the daily harassment that we face on our way to the centre’, chorused the girls but not before I heard a small voice, ‘I will eat more vegetable and fruits for better health’. These are the small but significant desires to bring about change from participants in Baladbandh and Kumrogodi, on the English and Digital for Girls’ Education (EDGE) pilot project with Rasik Bhita, an organisation working with women in West Bengal’s Hoogly district. EDGE aims to improve the life prospects of adolescent girls in socio-economically marginalised communities in Bangladesh, India and Nepal where digital and gender divides are significant, and opportunities are limited. The programme focuses on providing participants with training and resources to develop their English proficiency, digital skills, 21st century skills and awareness of social issues in peer-led after-school clubs. The programme also aims to build trust within the communities to change and develop the perception of the value of girls within those communities. To date the programme has reached over 17,000 girls in 750 clubs across the region. In a pilot project with Rasik Bhita, a group of adolescent girls recently met over a two-week period to trial the materials and Peer Group Leader model. The girls supported each other’s learning in these informal yet structured input sessions on English, digital and social skills. Eight British Council trained PGLs facilitated sessions and the participants benefited from a relaxed and enjoyable approach in the centre. ‘I did not know that learning was fun!’ said a PGL, a thought echoed by the participants after a round of a memory game aiming to practice greetings and small talk in English. Girls in South Asia continue to face innumerable challenges in their lives, many of which are due to unequal perceptions of gender equality. According to the UN’s Economic and Social Council, as many as 19 per cent of women experience violence at home. Although instances are reducing, early marriage is a common obstacle in the education and employment of women. Poor hygiene, lack of sanitation and poor nutrition are also daily concerns. Women also work as much as three times more than men in domestic chores which can prohibit or delay their educational and professional development. A UNESCO report from 2013 (UNESCO’s Education for All Global Monitoring Report 2013) shows that educated rural women can bring about a host of changes in their lives and in the lives of people around them. For example, educated women are less likely to marry early and consequently early child-bearing risks can be reduced, leading to lower infant mortality rates. Educated women value hygiene and health which leads to better nutrition of their children. Also, an educated woman is more likely to find work and gain financial stability. In 2018, the British Council is undertaking a detailed study to explore livelihood opportunities for women in South Asia, ensuring that the EDGE programme develops the most appropriate skills for these young people. Fostering 21st century skills such as critical thinking, problem solving and creativity. For more information, read about the British Council’s approach to promoting gender equality and the EDGE project. Posted in English, Teacher education and development, Uncategorized on April 20, 2018 by Nataasha Southwell. I’ve shamelessly stolen the title of this blog from Jim Scrivener, whose presentation I attended at the recent IATEFL* conference in Brighton. I’m not sure I entirely agree – good teaching clearly supports effective learning – but the sentiment interests me, not least because it seems to sum up one of the emerging themes of the conference this year: English language teachers need to remember what is truly important about the work that we do and not let ourselves get distracted by all the various trappings of the multi-million dollar industry that has grown up around ELT**. In my experience, most conferences can be boiled down into a few key messages for participants to take away. I don’t think these are always planned or intentional – although the existence of a conference theme can help give them some direction – but instead the current collective consciousness of the profession often seems to emerge during the course of the event. Of course, these are subjective to a large extent, but conversations with others suggest at least some commonality. These themes aren’t shaped only by fads or trends within the profession, but also by the way the world is changing around us. Technology is an obvious example – many recent conferences have reflected on (and usually championed) the integration of technology into our teaching. But this year at IATEFL it was interesting to note people questioning the its role. As its use gathers pace, do we need to consider going back to basics and ensure that we are controlling the use of digital tools, rather than the other way round? Similarly, there were questions raised around the publishing industry and whether it has lost sight of its true purpose. According to the hugely popular plenary speaker Dorothy Zemach, many publishers are focusing too much on making money and retaining their market share rather than ensuring the quality of their products and capitalising on the creativity of experienced ELT writers. She called upon teachers to be more discerning in their choice of course book and to question the motives when offered multiple wraparound elements for free which might actually just distract from effective classroom teaching and learning. Dorothy also questioned whether a one size fits all global approach to product development was really helpful, beyond the reduction in costs this provides for publishers. This was highlighted again in Barry O’Sullivan’s entertaining plenary, where he called for assessments to be made more localised and personalised to individual needs and context. Brita Fernandez Schmidt from Women for Women International had a strong message for delegates about the purpose and power of English and education more generally: women supported by this organisation in countries including Nigeria, Iraq and Afghanistan have escaped poverty, violence and damaging ingrained social norms as a result of educational interventions. English has considerable power to enable positive change by generating hope and opportunity for a better life and as English language teachers we have the capacity to be agents of that change. To paraphrase Spider-Man, we mustn’t forget the great responsibility that comes with that power. To return to Jim Scrivener’s statement, it is true that learning matters most of all, not only for our students but also for teachers. Attending conferences supports teacher learning – and hopefully as a result of that, their learners – not just because of the content and ideas shared in each session but also the learning that takes place on the sidelines. Networking with colleagues and meeting new ones is key, as is critically reflecting on the messages and themes that bubble under the surface, taking shape only as the conference develops. What conferences are you attending this year? Our new conference calendar might help you to decide. If you know of others we should include, please let us know. A selection of the best sessions from IATEFL 2018 are available to view online here. 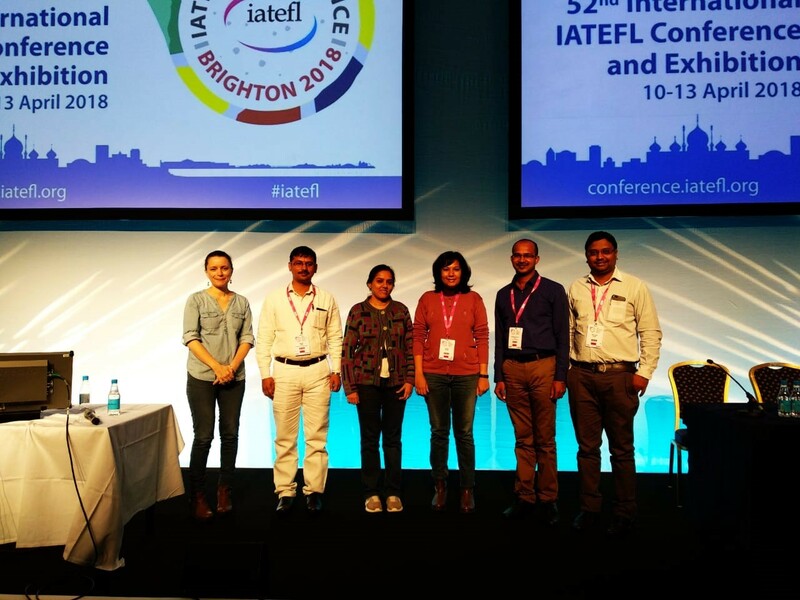 Representatives from British Council India’s delegation to IATEFL (L-R): Amy Lightfoot; Nagesh Lohare; Urvi Shah; Radhika Gholkar; Ashok Chavan; Nisar Shaikh. Posted in English and tagged Apps, English, myEnglish, Online resources, Speaking skills, Webinar, Websites on February 22, 2018 by English Language Services. What do you think is involved in speaking English well? Which of these do you find most difficult? People may lack confidence in speaking English because they don’t have enough opportunities to practice. If that’s you, don’t worry: There are things you can do to improve your speaking on your own, using online resources. This is the ability to put your ideas into speech quickly and clearly. This does not mean talking quickly – that can be very confusing for your listener! Improving anything needs practice so you have to practice speaking out loud, even if you are alone. Read aloud every day. This exercises your vocal muscles. Just like any other muscle, they need a regular workout. It’s a good idea to listen first to what you are going to read aloud so you have a good model to copy. ‘You’re Hired’ series from the British Council Learn English website looks at skills for finding a job. You could watch the videos and then practice the dialogue. There are several different features of good pronunciation; from being able to say individual sounds to saying whole chunks of speech. A good place to start is with individual sounds. Practising these out loud will help you to better say them. 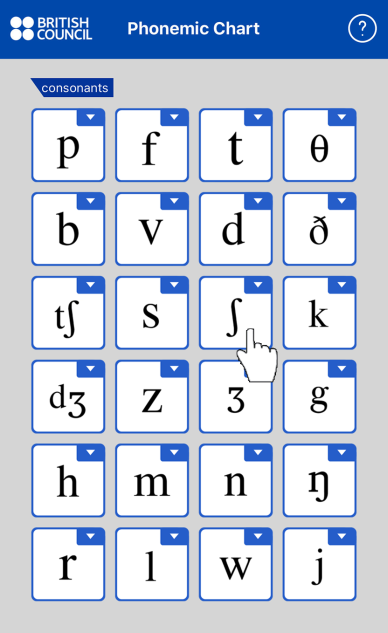 You will find phonemic script very useful. It’s used to describe the sounds of language (not the spelling). 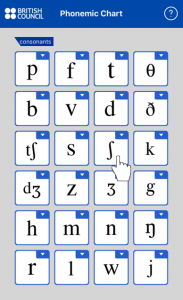 The British Council has a free interactive phonemic chart to download as an app. Understanding phonemic script is useful when you’re looking up words in the dictionary, as good dictionaries use this to show the pronunciation of words. Do you know which sounds you find more difficult? Perhaps saying ‘th’? By listening to and practising these sounds out loud, you can make improvements to your speech. Strategies for opening, keeping the conversation going and responding help you communicate more easily. Learning useful phrases to use in conversation is more useful than learning lots of individual words. Note down new expressions and use them often. If you don’t have a chance to say to them, why not use them in informal text chats on social media? Text chatting (e.g. WhatsApp) and spoken conversations have similar features. Use the pause button and repeat whole phrases when you are listening. This will help you to get used to saying them right and remember them. The British Council also has a soap opera ‘Big City, Small World’ which will help you to learn and use everyday expressions in your conversations. We hope you have found these tips useful and they have motivated you to go online and practice to improve your speaking skills and confidence. Teachers, research and evidence: a happy marriage? Posted in Teacher education and development on September 25, 2017 by Nataasha Southwell. Do teachers make enough use of evidence to inform their classroom practice? This was a key underlying theme of the International Association for Teachers of English as a Foreign Language (IATEFL) conference, held earlier this year in Glasgow. It’s a growing topic of conversation in education circles generally, including English language teaching. Some excellent initiatives are underway to try to promote more informed teaching in the classroom. For example, ELT Research Bites aims to present research findings related to ELT in an accessible and ‘easily digestible’ way. The relatively new Chartered College of Teaching in the UK has made access to the EBSCO research database a cornerstone of teacher and associate membership. The inaugural issue of their journal series focused on impact and evidence. But what do we mean when we talk about ‘research’ and ‘evidence’? For some, the word ‘research’ has negative connotations; it might suggest an outsider view on what is taking place on the ground, or it might be assumed to be impenetrable or inaccessible – aimed at other people, not at me. But research in the broadest sense can be defined simply as asking questions and looking for possible answers or explanations. In other words, research is the process through which we look for evidence which can support (or refute) decisions about what to do in the classroom. Evidence can come from a wide range of sources. These include external sources considered to be particularly trustworthy, such as peer-reviewed academic journals, but arguably just as useful are reflections from fellow teachers on what seems to be working (or not) in their classrooms perhaps via blogs or shared more informally. With all of this externally-sourced evidence, John Hattie suggests that the individual teacher still needs to be the final judge of its relevance and applicability to their own context. What works (or doesn’t) for one individual or group of individuals is never fully guaranteed to work for another when we’re talking about the social sciences, regardless of how robust the data is. With this in mind, there is a growing movement within education communities around the world to encourage teachers to undertake research for themselves, within their own classroom settings. Again, in its simplest form this involves the framing of questions (or a question) and seeking answers. This approach is being actively promoted through a network of professionals working in English language teaching who have established the International Festival of Teacher Research in ELT. This aims to bring together details of events happening around the world and highlight the benefits of and approaches to teachers undertaking research. So far, affiliated events have been held in Turkey, the UK, Argentina, Brazil, Australia, online through the TESOL Electronic Village and in India, with over 1,500 participating education professionals globally. Most recently, the All India Network of English Teachers organised a two day conference in Nagpur, central India, to provide a platform for teachers across the country to share the results of their small scale, classroom-based research. A key feature of the event was a series of presentations by teachers and teacher educators who have been participating as mentors in British Council India’s Aptis Action Research Mentoring Scheme (AARMS). AARMS seeks to develop a network of 14 mentors, working directly with two of the leaders in the ELT teacher research field – Dr Richard Smith from the University of Warwick and Dr Amol Padwad of AINET. The mentors work with more than 80 teachers across India to develop their skills in conducting relevant, classroom-based research related to English language teaching. This Nagpur conference was closely followed by a four day workshop at Gauhati University, also supported by the British Council and the IATEFL Teacher Development SIG, with Dr Smith and Dr Padwad introducing the principles and practices of exploratory action research to 30 teachers and teacher educators. The benefits of classroom research shared through these conference events and from those involved in the AARMS scheme are clear. External research is all very well, but teachers’ reflecting on their own practice, setting their own research questions and actively seeking the answers is the surest way to improve classroom teaching in a way that is contextualised to and appropriate for individual learners’ needs. Martyn Hammersley from The Open University has talked about ‘the privileging of research evidence over evidence from other sources, especially professional experience’: there is no doubt that the former is important, but teachers need to take ownership of the research process and actively find evidence that applies directly to their own classroom. Posted in English, Teacher education and development on July 14, 2017 by Nataasha Southwell. India has a long tradition of educational research dating back to the pre-independence period which has included the foundation and development of national and state agencies including the National Council of Educational Research and Training (NCERT) and State Councils of Educational Research and Training (SCERT). However, as David Graddol (2010: 98), for example, has pointed out, the results of this research have not always reached the wider world and India may have been under-represented in the international academic community. British Council India places considerable emphasis on encouraging and supporting educational research and a key strand of that work, for a number of years, was the English Language Teaching Partnerships (ELTReP) Award programme. The ELTRePs programme ran from 2012 to 2016, with the aim of facilitating high quality, innovative research to benefit the learning and teaching of English in India and to improve the access of ELT policy makers and professionals from India, the United Kingdom and the global ELT community to that research. Researchers on this programme have been supported in undertaking explorations in a wide range of contexts. All writers are practitioners in the field of English language teaching and learning in India, whether teachers, lecturers, educational department personnel or in other roles that involve day-to-day contact with the teaching and learning of English. Our new publication series Explorations: Teaching and Learning English in India brings together thirty three papers which are describe the research undertaken, and present findings and recommendations which we hope will be of benefit to a wider audience. The papers are presented in a series of eleven issues, each containing three papers and each addressing one of the professional practices detailed in the British Council framework for continuing professional development. Topics include a focus on understanding learners, managing resources and the use of information technology, assessing learners, taking responsibility for continuing professional development and using inclusive and multilingual approaches. Each paper reflects the creativity, detailed awareness of context and practical suggestions of the wide range of writers, from different backgrounds and working in different situations. They present results which in each case are innovative and thought-provoking. The papers deal in different ways with the teaching and learning of English in India today and offer suggestions on how to meet these challenges. Twenty-two of the papers have been edited by Professor Brian Tomlinson, Honorary Visiting Professor, University of Liverpool, TESOL Professor, Anaheim University. A further eleven papers were edited by Andy Keedwell, Senior Academic Manager, British Council India. Both editors worked in collaboration with the writers themselves. We hope you enjoy Explorations: Teaching and Learning English in India Issue 1 and find it helpful for the context you work in. Issue 2 will be released in August 2017. Graddol, D. (2010) English next India: the future of English in India. London: British Council.